In an era of hardening religious attitudes and explosive religious violence, this book offers a welcome antidote. 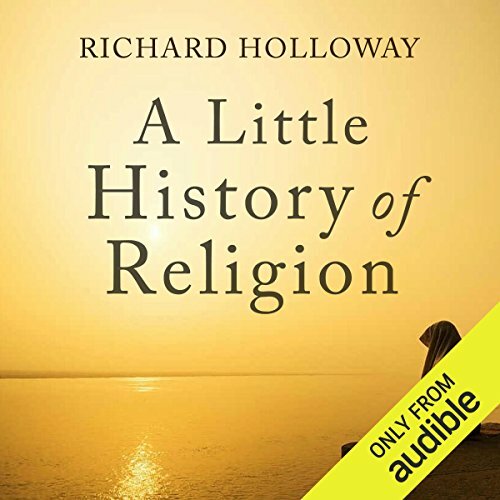 Richard Holloway retells the entire history of religion - from the dawn of religious belief to the 21st century - with deepest respect and a keen commitment to accuracy. Ranging far beyond the major world religions of Judaism, Islam, Christianity, Buddhism, and Hinduism, Holloway also examines where religious belief comes from, the search for meaning throughout history, today's fascinations with Scientology and creationism, religiously motivated violence, hostilities between religious people and secularists and more. Holloway proves an empathic yet discerning guide to the enduring significance of faith and its power from ancient times to our own. Great introductory read for anyone who wants to educate themselves in a faith that isn't their own and anyone who wants to better understand the roots of their own faith. there was little-to-no apologetics. It really broke down how all the religions came to be. A must for anyone who has ever wondered about the many different religions and why. Excellent "in a nutshell" book! This is a great book for all ages and gives you a well rounded view of religions of the world, views of God and where we started all the thinking from. Great narration, great info, great book. Wonderful narrator and a story that weaves its subject matter together seamlessly makes for a perfect overview. I appreciated the targeted, chronological approach of this book. It consumes a huge topic and produces a concise and informative narrative. The author’s approach to religion’s history and study leaves something to be desired though. Holloway seems to operate with the assumption that religious people cannot engage in the objective study of religion. (And in consequence, read his book.) He tells the story of religion through his own biases, without distinguishing them as such. While there is a place for criticism, just like devotion, in religious study, it is separate from objectivity. He disregards this distinction treating his own viewpoints as being the same thing. I find religion interesting in general and wanted an unbiased history of religion that would let me learn about multiple religions. While completely unbiased is kind of impossible, this book did a pretty good job. It definitely follows the religions of Abraham more than others, but after completing the book I feel that this made sense.I left feeling like I learned a lot and I've recommended this book to many people. Couldn’t recommend a better book for a brief history of most of the religions. This book is as straightforward as it can be with no inclination to a particular extreme view. It lays information before you and allows you to ponder about it, makes you comprehend your own views. As a reader, this book probably liberated my mind regarding my thoughts on the subject and inspired me to know more and for that I would give it 5 stars. This book is perfect for adults and older kids who are interested in the facts behind world religions and not just the dogma. The text is very well written in a narrative fashion, so you feel like you are listening to a story, and the narrator is absolute perfection. Highly recommend. I had long been looking for a book to fill the gaps in my knowledge about where religions come from and how did they intertwine in history. This book gives a great and very objective overview of the origins, similarities, differences and human mixups in the stories of all the main religions. It does not prefer one to another nor glorify subscribing to religious denominations in general. And yet it manages to not be too academic or repetitive as some very objective books tend to be. Recommend to anyone who wants a short but solid overview of religion(s) in an objective way. Very good from a storytelling perspective too and an awesome performance by James Bryce.